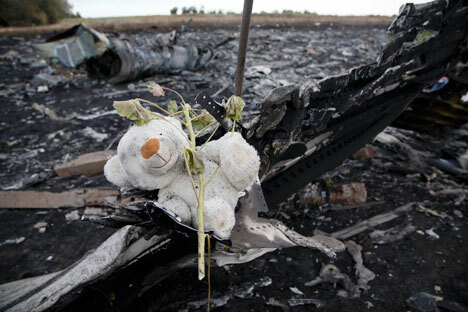 RBTH presents a selection of views from leading Russian media on the latest developments surrounding the July 17 Boeing 777 catastrophe in Ukraine's Donetsk Region, in which Malaysia Airlines Flight MH17 was apparently shot down near the town of Shakhtarsk in an area controlled by pro-autonomy militias. The newspaper Kommersant reports that the Russian Defense Ministry has presented an argument in favor of the theory that the Boeing could have been shot down by the Ukrainian armed forces. According to the ministry, the plane’s trajectory over the Donetsk Region indicates that it had deviated from its intended route. It will only be possible to clarify why the plane strayed off course after the flight recorders have been decoded, Kommersant writes. Citing the Defense Ministry, the newspaper reports that a Ukrainian air defense unit consisting or “three or four” Buk surface-to-air missile complexes was located in Donetsk on the day of the crash, and the fallen airliner’s route fell within its zone of maneuver. The Russian Defense Ministry has refuted a statement by the Ukrainian authorities that there were no military aircraft near Donetsk at the moment the Boeing crashed. The military documented “the ascent of a Ukrainian Air Defense airplane, presumably an Su-25,” Kommersant writes. “However, none of these arguments seem to convince the West,” the newspaper writes. The pressure on Russia continues to rise, which makes stricter sanctions all the more likely. In Nezavisimaya Gazeta’s opinion, Russia has shown that it was politically unprepared for the tragedy in Donetsk. Despite that, the Russian authorities are trying to make deliberate, calm statements with respect to the Boeing crash. Last week, the Kremlin made apparent its intention to gradually withdraw from the Ukraine conflict, the newspaper writes. “At the same time, Moscow stresses that it has no influence over the militias and that it can’t force them to do anything. No one in Kiev or in the West believes that,” Nezavisimaya Gazeta writes. “There is no common ground on which Kiev and Moscow would be willing to talk about the situation in the south-east,” because “for Kiev, the militias are still terrorists and separatists, and for Moscow, the anti-terrorist operation is still retaliatory,” the newspaper reports. If the international commission concludes that the Boeing was shot down by “separatists”, Russia will no longer be able to stand on the sidelines as a third party. No one will talk sense into the militias, Kiev and Petro Poroshenko will receive a clear mandate to liquidate them, and the negotiation scheme proffered by Moscow will not be considered suitable at any level, the newspaper writes. In that case, Moscow will be threatened with new economic sanctions and partial isolation. “Russia will publish its own detailed version of the events surrounding the Boeing crash, [which will be] fairly convincing with respect to the domestic audience and marginally convincing for the foreign audience,” Nezavisimaya Gazeta reports. Gazeta.ru has published an article under the headline “Guilty by Default,” in which it writes that just four days after the tragedy, the accusations leveled by the West against Russia have softened to diplomatic appeals to facilitate a thorough investigation. According to the publication, the only possible peaceful way out of this grave situation is for all of the parties to cease their groundless accusations and to stop escalating the conflict. The ever-growing aggressive tone in western discussions about the tragedy is giving off the impression of two extremes: “Either everyone has known for a long time what actually happened but for some reason hid the truth, or the knowledge of the parties does not go far beyond their own delusions,” Gazeta.ru writes. The Russian media has been accused of propaganda and subjectivity, but meanwhile, western journalists had accused Russia of being behind the crash before the investigation even began, Gazeta.ru writes. At this point, what is needed are not “diplomatic negotiations” with streamlined wording, but as open an investigation as possible, as well as the publication and mutual exchange of all reliable data, the publication concludes.